Delta Air Lines is getting a new look for the runway. The number two U.S. airline unveiled a new set of designer uniforms for 60,000 of its employees on Tuesday, the first major overhaul for the airline in a decade. All three of the largest U.S. carriers, flush with profit, have unveiled redesigned uniforms in recent years, a central part of an airline's branding. Delta tapped designer Zac Posen for its new uniforms, replacing its current uniforms for its flight attendants, gate agent and technicians. The current uniforms predate Delta's 2008 merger with Northwest Airlines. Land's End will supply the uniforms to the Atlanta-based airline. Posen named the designs after an alliterative and travel-inspired color palette. 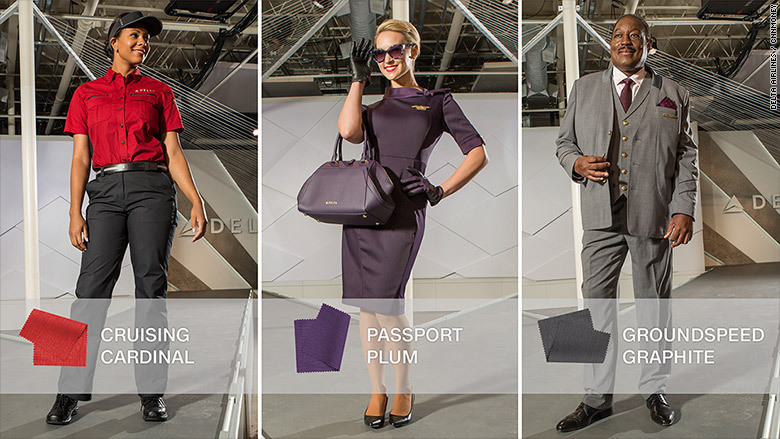 Flight attendant dresses, wraps and skirt suits will be a "Passport Plum" and three-piece suits will come in "Groundspeed Graphite." Technical employees working on the ramp or at its TechOps division will wear "Skyline Slate" and "Cruising Cardinal" in the often harsh environments working with and around aircraft. About 1,000 of the airline's 60,000 front line staff will begin testing the new uniforms in December. Those real-world trials will last until early 2017 so the designs can be tweaked. The new uniforms will roll out in the first quarter of 2018. An airline spokesperson declined to say how much Delta (DAL) spent to develop the new uniforms. The new uniforms are another indication that the airline business is in good financial health. The industry has been restructured over the past decade through a series of bankruptcies and mergers. The three biggest airlines are each updating their uniforms as a part of a broad overhaul. The facelifts include new fuel-efficient airliners that have updated interiors designed to match their newly-outfitted staff. Rolling out new uniforms isn't always easy. When American Airlines debuted new uniforms in September, it was the first major overhaul for many of its staff since the 1980s. But flight attendants have complained that the new wool uniforms made them sick, causing skin irritation and headaches, according to the Association of Professional Flight Attendants, the union representing American's cabin staff. A spokesman for American (AAL) said the response to its new uniforms has been "overwhelmingly positive", but said that some flight attendants have experienced itchiness. The carrier has been offering a non-wool option to employees. "We want to get it right for everyone," the spokesman said. United (UAL) said in March that it began testing revisions to its three-year old uniforms after "many United employees have expressed frustrations about the durability and functionality." A United spokeswoman said Tuesday it completed testing over the summer and its new uniforms will be deployed in early 2017.